The focus of your study has been the person and the tireless pastoral and humanitarian work of Pius XII, Pastor Angelicus. Fifty years have passed since his pious death here at Castel Gandolfo early on the ninth of October 1958, after a debilitating disease. This anniversary provides an important opportunity to deepen our knowledge of him, to meditate on his rich teaching and to analyze thoroughly his activities. So much has been written and said of him during these last five decades and not all of the genuine facets of his diverse pastoral activity have been examined in a just light. The aim of your symposium has been precisely to address some of these deficiencies, conducting a careful and documented examination of many of his interventions, especially those in favour of the Jews who in those years were being targeted all over Europe, in accordance with the criminal plan of those who wanted to eliminate them from the face of the earth. When one draws close to this noble Pope, free from ideological prejudices, in addition to being struck by his lofty spiritual and human character one is also captivated by the example of his life and the extraordinary richness of his teaching. One can also come to appreciate the human wisdom and pastoral intensity which guided him in his long years of ministry, especially in providing organized assistance to the Jewish people. Thanks to the vast quantity of documented material which you have gathered, supported by many authoritative testimonies, your symposium offers to the public forum the possibility of knowing more fully what Pius XII achieved for the Jews persecuted by the Nazi and fascist regimes. One understands, then, that wherever possible he spared no effort in intervening in their favour either directly or through instructions given to other individuals or to institutions of the Catholic Church. In the proceedings of your convention you have also drawn attention to his many interventions, made secretly and silently, precisely because, given the concrete situation of that difficult historical moment, only in this way was it possible to avoid the worst and save the greatest number of Jews. This courageous and paternal dedication was recognized and appreciated during and after the terrible world conflict by Jewish communities and individuals who showed their gratitude for what the Pope had done for them. 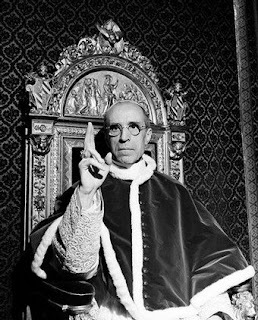 One need only recall Pius XII’s meeting on the 29th of November 1945 with eighty delegates of German concentration camps who during a special Audience granted to them at the Vatican, wished to thank him personally for his generosity to them during the terrible period of Nazi-fascist persecution. A major Vatican conference on Pius' 19-year pontificate and its lasting impact will be held in November. Head Trid on Mass Hysteria: Enough! "This Guy Did Something Saintly"